Dell Quay members competing in Chichester Harbour Race Week 2017 had great sailing - and came home with a winner's prize plate, satisfaction at other good results and stories to tell to encourage more fellow members to enter next year. Martyn Jones sealed the Laser Radial title with a day to spare, following his second place on Tuesday (Monday's racing was postponed due to lack of wind) with three straight wins in the 17-strong fleet. Thursday, when the wind was a little less challenging than on Tuesday and Wednesday, was the glory day for Sue and Beckie Manning, racing the club's 2000 against 27 other two-man (or woman in their case) medium handicap dinghies. They were first of the ten 2000s in the event to cross the finish line, and took fleet third place on handicap. On Wednesday they had survived the two very breezy races thanks to a neat on-the-water reefing exercise, and they completed the week with a sixth place, to make them eighth overall. Most Dell Quay entries were in the 35-strong Solo fleet, where Mark Harper and Roger Puttock took 11th and 12th places respectively. Roger's week got better and better, ending with two eighth places, while Mark's best results were a sixth and seventh in the first two races. David Maltby, who had the misfortune to break his kicker in race one, was 22nd, and Mike Shaw was delighted he overcame his hesitancy to enter the event - he finished every race, and was 26th overall. 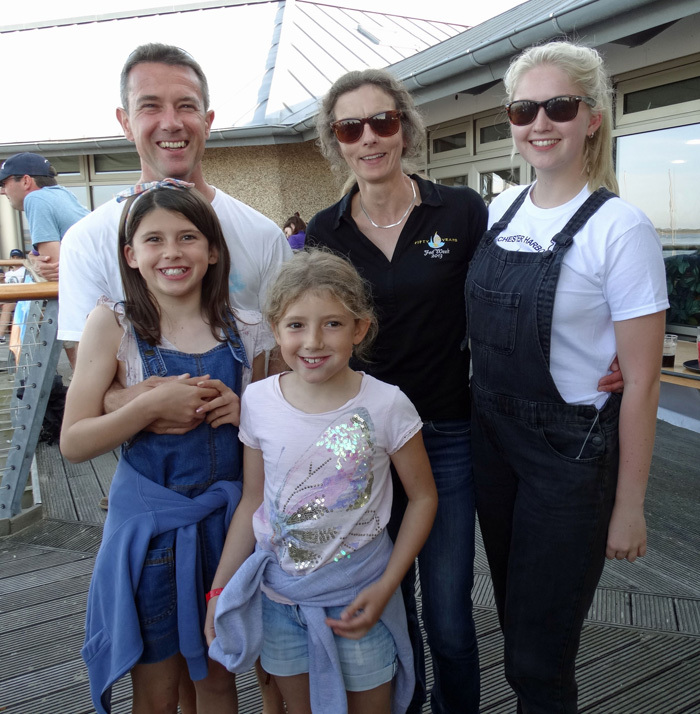 Dell Quay's team also included two of event's youngest entrants, Hazel and Ella Jones, sailing Optimists. They raced on only two days, which made Hazel's fifth place overall a good result, albeit in a small fleet. The club didn't figure in the team trophy prize list - hardly surprising, as other harbour clubs had much bigger entries from which to select their chosen team. But Dell Quay wasn't at the bottom of the list! Next year's Race Week is August 13th to 17th. Let's see club entries go well into double figures, and more people involved in helping run the event - this year Dell Quay's volunteers were Roy and Beryl Dyton, Peter and Jane Matthews, Nikki Buchanan, Chris Campbell, Rob Nunn and Liz and Jean Sagues.